This could be one of those myths that circulate on the Internet, but apparently in certain regions of Italy, gnocchi (Italian for dumplings) are known as strangolopetri, meaning priest stranglers. The story goes that one time, long ago, a cleric enjoyed his meal so much, and ate it so fast, that he choked on it. The tale has a ring of truth. If any dish could inspire a state of unbridled gusto, surely it’s a bowl of beautifully bouncy potato dumplings? Gnocchi, when done right, pretty much typify the wonder of Italian cuisine: few, top quality ingredients, age-old techniques, and utter simplicity. Or perhaps we might say, deceptive simplicity. As anyone who has attempted to make gnocchi at home knows, there are only three or four ingredients but many variables — many opportunities to create heavy, doughy glue balls or mushy mash rather than ethereal mini-mounds of pure pleasure. For those of us who were not born into a family in possession of an old-as-the-hills wooden gnocchi board upon which smooth ridges can be worked by loving and capable hands into delicate dumpling dough, there’s Mamma Nicastro. Enter the naturally bright Café Ventuno at lunchtime and forget about the damp, drizzly weather outside. Start with a crisp, citrusy Caesar salad with bits of crisp pancetta and a snowy blanket of freshly grated parmesan or devour a tangle of light golden, tender calamari flecked with crispy basil leaves. 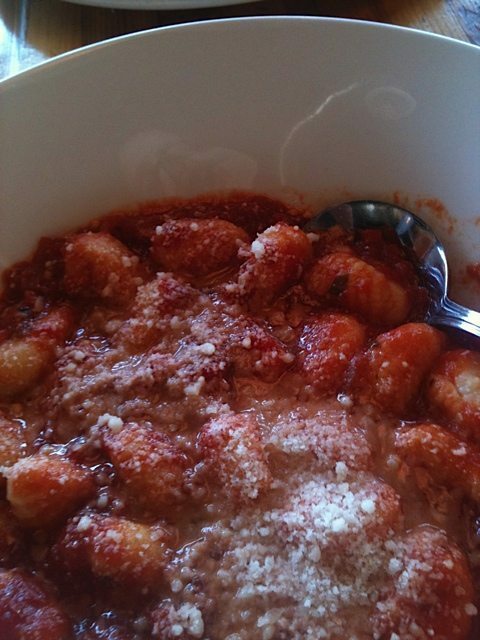 Then, settle in for the comforting embrace of Mamma’s superb gnocchi bathed in a classic slow-simmered rich and rustic tomato sauce. Made with ricotta and shaped like life-sized bent knuckles, the gnocchi have a pleasant, if not pillowy texture, soft and not at all gummy. Go ahead, clean the bowl. Just take is slowly. These gnocchi are good, but not necesarrily to-die-for good. Caffe Ventuno, 1355 Wellington St. , 613-729-9121.